What Google wants to see is authoritative and relatable links talking about your site. Many entrepreneurs, business owners and marketers can relate to the difficulty of growing a business. Not only do you have to execute on the day-to-day operations but you also have to serve as a sales rep if you want to successfully grow. A great solution to get more business without having to dedicate valuable time to networking events and cold calling is link building. This has helped my agency, The Media Captain, grow into one of the largest digital shops in Ohio. I’ve also helped hundreds of clients increase their Google rank by following the methods below. I’m going to teach beginners the basic foundation of link building and how it can help your business move from the fifth page of Google to the first. Our digital agency ranks prominently in the Columbus market (our hometown) for a wide variety of keywords. My family business, DermWarehouse, ranks nationally for skincare and beauty products after opening our doors less than a year ago. As you can imagine, if you achieve page one rankings on Google, it can be a huge differentiator for your business. I’m here to teach you how to execute this strategy successfully for your own business. Backlinks are the foundation of Google's algorithm for determining a site’s page rank. If you want a complex explanation of the original PageRank algorithm, click here. I'll give you the CliffsNotes version: Google views your site as authoritative when other sites link back to it. It doesn’t want to see a site that is spammy linking back to your site. If you try and manipulate the system, you can get hit with a Google penalty and your site won't rank at all. Below is an example of a backlink I acquired for my family business, DermWarehouse. You can see that we got my dad, a dermatologist who is the face of the operation, quoted in Seventeen magazine. This is an authoritative website that is now linking back to DermWarehouse. Better yet, the content relates to skincare and beauty, which means it is relevant. Anytime you are trying to acquire backlinks, remember the following three components. Authoritativeness: How powerful a website is in the eyes of Google. You can use a metric called Domain Authority to gauge this. Relevance: Does the website that is linking back to your website relate to your business? Make sure there is a strong relevance when acquiring backlinks. Locality: If you have a storefront location, you’ll want to make sure you acquire local backlinks. This can be from the Better Business Bureau, a sponsorship of a local baseball team, etc. 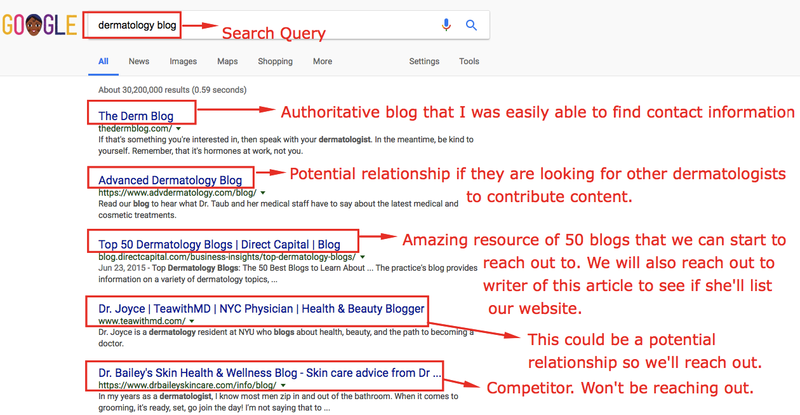 If you build up the credibility on your website to the point where it has a high domain authority, internal blogs can be a great way to lure in new website traffic into your funnel. If you are writing a blog for a brand-new website that has no authority, chances are that nobody will find this on Google. It is the equivalent of writing a great book but it’s not in any bookstores, so people can’t find it and therefore can’t read it. It is more important, especially in the early stages of a website, to write content for external websites. Is it helpful to have fresh content on your site? Yes. You can also promote this content on social media. This won’t move the needle for your SEO though. If you own a hockey shop in Cleveland, Ohio, you can find hockey-related websites where you can contribute article content talking about the best goalie skates for 2017 or the different sticks used by the top 10 scorers in the league. You can also write for a local Cleveland website where you give advice on the best spots for pond hockey in the city. In the examples above, the Cleveland hockey shop would be getting links on authoritative, industry-related websites along with local websites. People reading the articles on the external sites where the hockey guru is contributing content would be able to find out more about the Cleveland hockey shop by clicking on the author's bio or clicking on a hyperlink to one of the hockey skates he is referencing. This would result in high quality referral traffic, another positive to Google, in addition to the backlink. If this store owner sold goalie skates on his website, this could also generate new business. Any business owner or marketer should try to acquire between 4-5 relevant backlinks per month. This requires a lot of time and a skill for public relations and content creation. Remember, four authoritative links that are industry related beats 15 links that don't have any substance. Quality over quantity, my folks! How do I acquire backlinks? For DermWarehouse, we do a Google News search every morning for the following search terms: sunscreen, skin cancer, dermatologist and dermatology. You don’t have to do a Google News search. You could simply search on Google for “skincare blogs” or “beauty blogs” and find relevant sites this way. It is important to spend time researching relevant websites where you’d like to contribute content. You can use Moz’s tool, Open Site Explorer, to determine if the site you want to contribute on is credible based off of its domain authority. You could also use Open Site Explorer to look at recent links from your competitors. If they are getting quoted in Seventeen magazine, what's stopping you from being quoted in this publication? Once we do our research (which is a continuous/ongoing process), we then formulate a list of all of the reporters we find who write for various publications. Below is an example of how we keep track of the research we’ve conducted. It is pretty simple. We write down the website, the name of the author, the email address, the domain authority and then we keep track of the status. The tricky part of this is finding the email address. 3. Find the email address. This is one of the most important parts of the outreach process. When you fill out a generic contact form on a website, your chances of contributing content are diminished. I don’t have hard statistics on this but I just know this to be true from doing it on a daily basis. If you can find an actual email address for the editor of the website or the author of an article, this is going to be the most beneficial and is the best way to increase your chances of forging a relationship. Start by looking in the footer of a site for a “contact” section or on the “About” page. If you can’t find an email address anywhere on the site, looking up someone on Twitter and sending him a message or finding him on LinkedIn are good ways to get in contact with the decision maker. LinkedIn Premium is also an awesome tool for SEO outreach. You can send direct messages when you find the right decision maker. Get creative with your research, as sometimes it can take a bit of digging to find what you’re after. 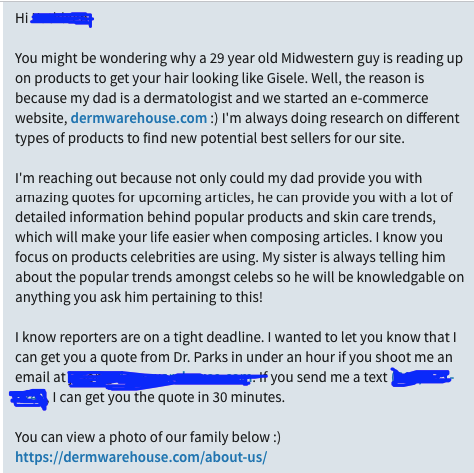 I recently did a search for “dermatology blog” and for the first blog I found on Google, I was able to find the email address of the webmaster and heard back from him within 24 hours. It isn’t that difficult folks, it just takes time and research! See below how I decide which sites to try and find contact information for. From what I’ve seen, many people fail miserably when it comes to crafting pitches. They try an automated software that spews out thousands of pitches over the course of the week yet there is no personal tone. Can this method result in relationships where you can contribute content? Absolutely. The more personal the pitch though, the higher your chances are of forging a relationship. You will also get connected with higher quality sites by taking a more personalized route. Below is a pitch that I crafted to try and get my dad quoted on authoritative websites like the Seventeen example above. You can see that I've actually taken the time to do research on the author that I intended on reaching out to. It is amazing that if you actually make things personalized, it can be a game changer. Once again, this is all just a matter of putting in the time. Most people give up if they send off a pitch and don’t hear back from a reporter, editor or webmaster. Before giving up on a prospect, we make sure to have five different touch points. We combine email, Twitter, LinkedIn, Instagram, etc., into the mix. Persistence here is key. Our agency is actually able to justify one of the biggest return on investments from the way we use social media as an outreach tool for SEO. 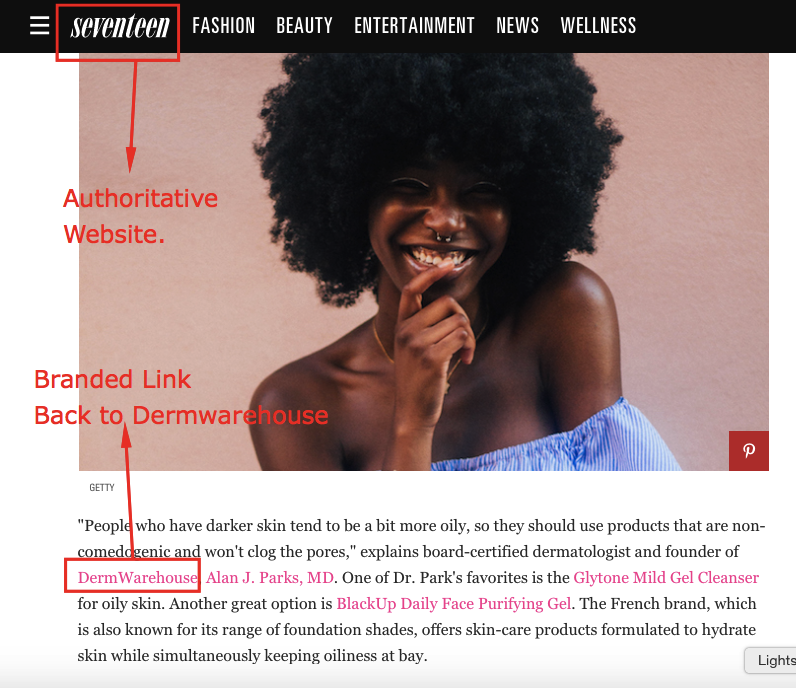 For DermWarehouse, we have a hybrid strategy of trying to get Dr. Parks quoted by reporters while also trying to find publications where he can contribute content. On the agency side with The Media Captain, whenever we onboard a new client we strategize on whether they want media mentions, if they just want to contribute external content or both. It is amazing how much SEO and sales relate to one another. If you are great at sales and have good journalism skills, you’ll be great at SEO. If you hear back from an editor or Webmaster and she wants you to contribute content to the site, this is a big win. Remember, she isn’t just doing you a favor. You are contributing valuable content to her site, which will bring more people into her funnel. Do not forget about this. Now it is time to write great content. If you are an expert in your field, make sure to provide value to readers so they will visit your site to learn more. Many sites will have guidelines that they will want you to follow, so make sure to follow the rules and be communicative with your point of contact at the publication. Also, you want to be transparent to make sure there will be a link to your site included somewhere in the article. You are going to spend five or more hours between conducting the outreach, forging the relationship and writing the content. You want to make sure you reap the benefits from an SEO perspective. Once your first article gets published, the journey has just begun. Make sure you can contribute more articles to this same site so you have an ongoing relationship. Ask the site if it will share the content to its social media channels so you can expand your reach. Continue the outreach process so you can forge more relationships, share your expertise to a wider audience and get more referral traffic back to your site. Since we’ve worked with hundreds of brands to improve their SEO, the biggest pitfall is lack of patience. It can take three months, six months, a year or even three years depending on the competitiveness of your industry. There are some instances where we can get a client in a non-competitive industry to rank very quickly. There are other instances where we find technical issues regarding the structure of the site and once we fix those, it results in a massive uptick in ranking. For the most part though, SEO is a long-term process. The best time to plant a tree is 20 years ago. The second best time is now. If you have plans to be in business for more than five years, you need to invest in SEO. You likely won’t see an immediate impact, but it has the potential to be the best return on investment for your business.